Suggestions and comments very welcome. That can be misleading info. emoncms records datapoints that reflect the values at a specific instance in time. The graphs draw lines between the datapoints. So if you were (for example) recording PV generation and you unplugged your emonTX at midday when PV gen was high, the the next day at midday you reconnected your emonTX during high PV gen, when you look at a graph it could well display that you had constant PV gen thoughout the night as it would join the 2 high points at midday of those 2 days. You need to be sure of what you are looking at. The best place to look for debugging info is the emonhub logs, if you go to the emonhub config page in emoncms, is there any activity? 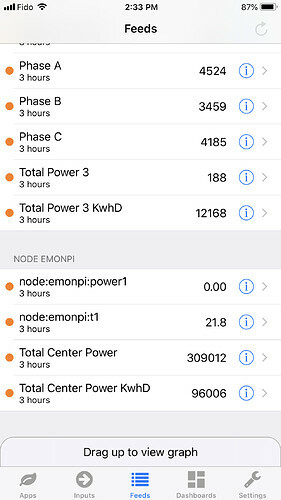 does it show the data being passed to emoncms via mqtt? You,ve only mentioned the feeds, have you looked at the inputs page? what does that say? 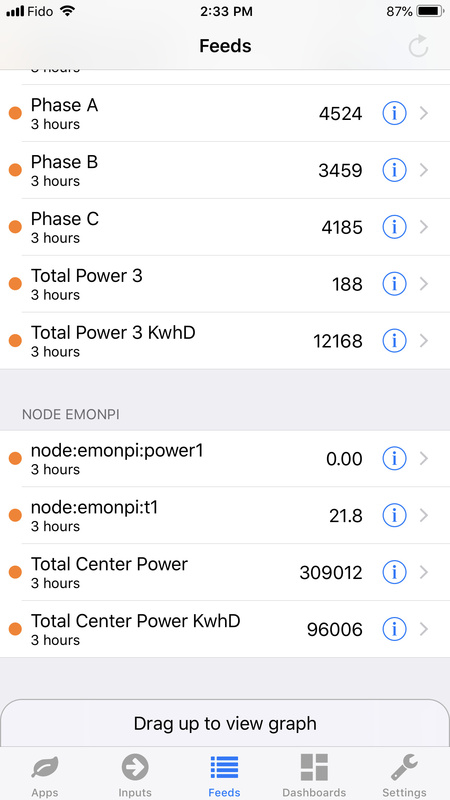 I would recommend using a browser to look directly at emoncms rather than through what looks like the iOS app. By looking at the app you are adding another level of interface, ie is emoncms ok but the iOS app not updating? I doubt it is that, but again, you need to be sure of what you are seeing. Plus there is more ifo on hand in the emoncms pages than the iOS app. Connected how? The RF traffic will get very busy if you are just using RF. even with just 3 emonTx’s you can expect collisions (2 or more emonTx’s transmitting at once, only the first get’s received the others are often lost) as the devices transmissions are not synchronised.